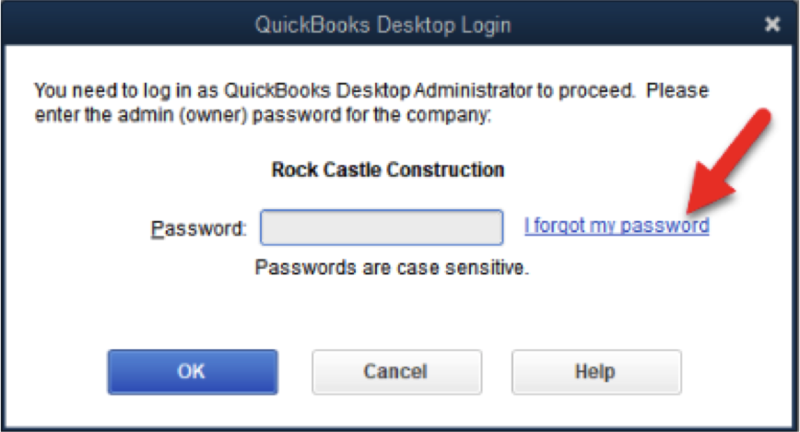 Learn what to do if you lost or forgot your password for QuickBooks Desktop on a Windows computer. If you don’t have your password, don’t worry. Here’s how to get back into your company file on a Windows computer. If you’re on a Mac, follow these steps instead. Just need to answer password reset questions? Head over to your account management portal (CAMPS). All the info you need is right there on the landing page once you log in. You don’t have to enter a user name. When you sign in, you just enter a password. You enter “Admin” or another admin user name you created. 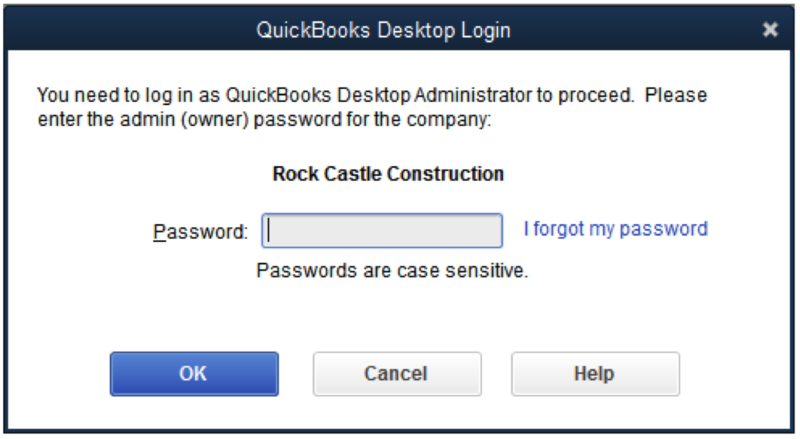 If you’re not an admin user, your QuickBooks admin can reset your password for you. Contact your admin and have them reset a user password. Once you know what type of password you need to reset, follow the steps below. If you know your admin password and simply want to change it, follow the steps to change your user password. If you need to reset your admin password because you don't remember it, you'll need to confirm some information as a security step. If you don’t remember the info, we’ll show you how to find it. 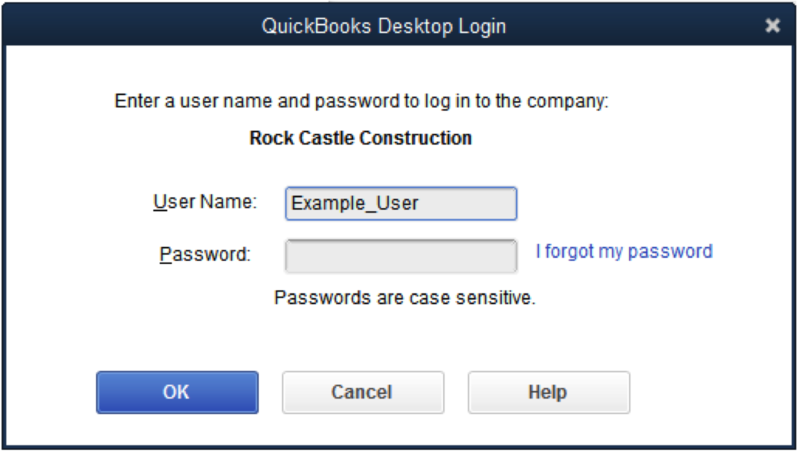 Open QuickBooks Desktop. At the login window, click the I forgot my password link. Your license number for the version of QuickBooks Desktop you’re using. (Press F2 from the login window to see your license number). The name, email address, phone number, and ZIP code you originally used when you purchased the product. Important: You can find all this info when you sign in to your account management portal (CAMPS). If you have trouble signing in, you can reset your CAMPS password. Click OK. If the info you entered is correct, you’ll be emailed a code you'll need to enter in QuickBooks at your registered email address. (This is your “primary email” listed in CAMPS). 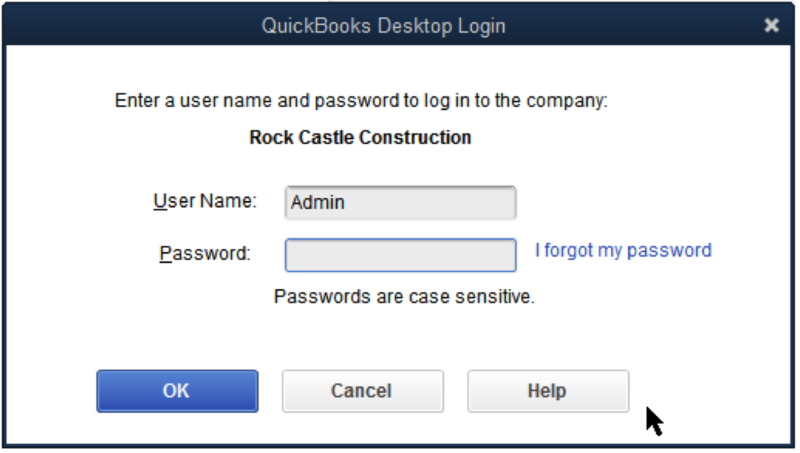 QuickBooks will then guide you through creating a new admin password. Double-check the information you entered. Check for any typos and confirm the info matches what's in CAMPS. If you got an error or still need help resetting your password, try the Automated Password Reset Tool. If you still need help, select Search for something else, type password, and click Search when you contact us. Sign in as the admin user. Go to Company, select Set Up Users and Passwords. Then select Set Up Users. If prompted, enter the admin password again. In the User List, select the user that needs to change their password. Then select Edit User. Select Next twice, then select Finish.